Tofu can be eaten in so many different ways, it is wonderful. 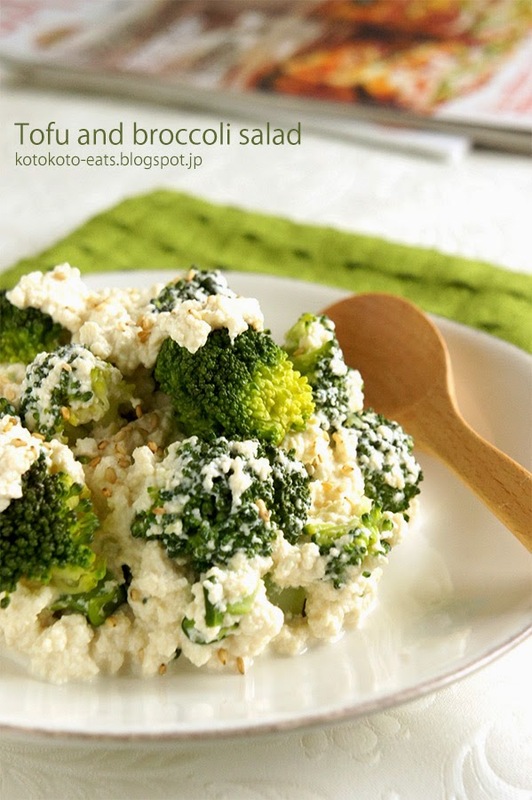 Today, I introduce "Tofu and Broccoli Salad". When tofu is used like this and mixed with some vegetables, the dish is typically called "shira-a-eh". The texture is almost like cottage cheese. 1) In order to remove excess moisture from the tofu, wrap the tofu in paper towel, place it in a bowl and microwave it for about 1 minute. Lightly squeeze the tofu and remove the rest of the moisture. Place it in a bowl. 3) Steam the broccoli. Place it into the bowl of tofu. 4) Add powdered dashi, soy sauce, and salt if needed. Mix well. 5) Sprinkle toasted sesame seeds. I sometime drizzle some good quality olive oil right before serving. It goes very well together.